Tsrava is a Khajiit acrobat living in J'bari's house in Leyawiin. She is an advanced trainer in Acrobatics, and quite unlike the other advanced Acrobatics trainer Ganredhel, she absolutely hates dogs. She wears middle-class attire consisting of a blue & green outfit and a pair of quilted shoes. She also carries the key to J'bari's house and a leveled amount of gold. Her first words to you combine her two main obsessions, acrobatics and dogs: "I'm Tsrava. I'm an Advanced Trainer in Acrobatics. Did I mention I hate dogs? So keep your dogs away from me... unless they want some advanced lessons in plunging from great heights..." Although Tsrava is a competent trainer, she knows her limits and once you have reached them she will send you in search of the one person who can teach you more, by saying, "I can't teach you anything you don't already know. Aerin could, though. She's a brilliant acrobat. Last I heard, she'd set up camp in the mountains, somewhere in the northeast corner of the province. You should look for her there." and "Search the mountains in the northeast of Cyrodiil for Aerin's Camp. Aerin can teach you all that you need to know." 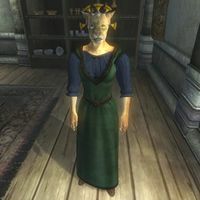 Her dislike for dogs comes up again when you ask her about Leyawiin: "Some clown keeps tossing meat out in my backyard, and it attracts dogs from Necrom to Daggerfall." Tsrava has evidently been complaining about dogs to the rest of town, and other people can be overheard talking about it: "Tsrava says the sound of J'bari's dogs drives her to distraction. Can't say I blame her. ", "Have you seen how upset Tsrava gets by all the dogs near her house? ", and "Did you hear how upset Tsrava is about all the dogs that J'bari has in his yard?"